I had a minor disaster the other day. I’d been away on a business trip for a couple of days, but before I went, I made a couple of batches of ice cream. I rinsed out the freezer bowl from the ice cream maker, the metal bit that goes in the freezer and does The Business and left it on the work surface above the dishwasher. It turns out that granite conducts the excess heat from a dishwasher really well, and the bowl must have heated up more than it should have, splitting the rim and letting a truly odd bright blue gunge leak out. -like in the ice cream making department.
. As an introduction to ice cream making, its first class, full of good recipes and better advice. I never really had much success with ice cream until I started using this book. There’s a fuller review here. So, black pepper ice cream. The pepper doesn’t end up in the finished product…it’s just used to add flavour to the cream and milk mixture before being discarded. 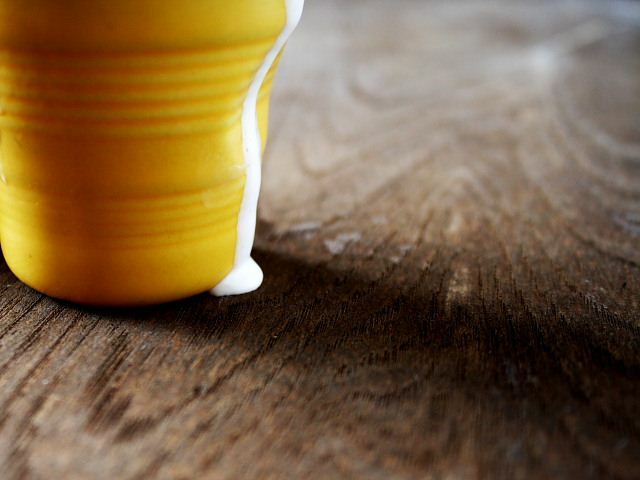 In a pan, warm 125ml each of whole milk and double cream with 65g of sugar, a pinch of salt and a good tablespoon of roughly cracked black pepper. Cover the pan, and let the pepper steep for about an hour. Warm the milk and cream mixture through again and slowly pour it over three large egg yolks, whisked together in a large bowl. Keep whisking all the time, and then transfer the mixture into a clean pan and gently warm it, stirring all the time. You’re making a custard, so keep it moving, scraping the bottom of the pan all the time to stop anything sticking. The custard will quickly coat the back of the spoon. When the custard has thickened, pour it through a sieve, into a bowl, squeezing the pepper with the back of the spoon to extract as much of the pepper infused cream out as possible. Stir another 125ml of double cream into the sieved mixture and chill the whole lot in a sink full of cold water. Put the bowl into the fridge and let it get really cold, preferably overnight. Churn the mixture in an ice cream machine the next morning, until the ice cream is thick and smooth. So sorry about your ice-cream bowl…I once had a housemate who put mine in the dishwasher and wrecked it. For what it’s worth, I upgraded to a nice 2-quart Cuisinart and I love the thing. This ice cream looks really interesting–the perfect combination of spicy and sweet! Wow, I never would have thought to use black pepper in a sweet and creamy treat. Thanks for the information on the book. I definitely need to try it out. I’ve managed to buy all sorts of replacement parts for kitchen gadgets on ebay, including a bowl for my old ice cream maker after the same discovery you did! I swear you can find anything on there. Black pepper ice cream sounds incredible. 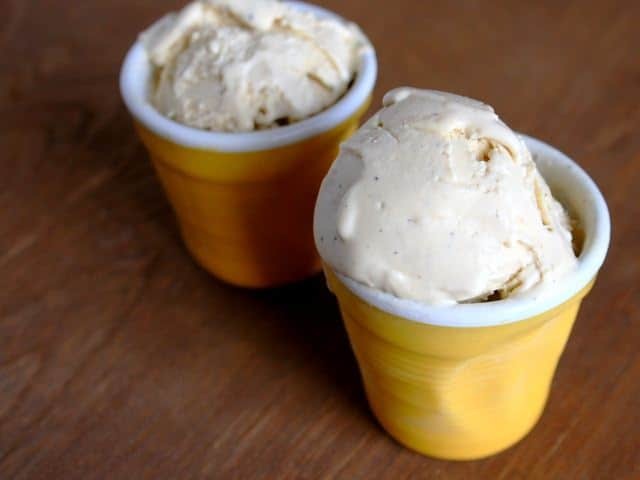 I remember last year balsamic ice cream was all the vogue – I think you just out-classed it. We have a “freeze the bowl” one too but we have a tiny freezer so it’s like tetris trying to pack it around the peas and kaffir lime leaves! This sounds like a really interesting flavour – I just got the new Icecreamists book with chilli, ginger & lemongrass icecream in. In two minds about making it! David Lebovitz’s ice cream recipes are awesome. Black pepper ice-cream sounds particuarly bloody superb. I’m definitely going to give this a try. I made this ice cream too last year and had a different disaster… i put double the peppercorns in. In a hurry – less haste and all that – dropped the sieve in the mix. Thinking only a few peppercorns could have made it through. Come time for dessert, one friend counted 12 chunks of near whole peppercorns in his bowl. I now have a ‘don’t let her give you ice cream’ reputation. Next I will see what I damage I can do with chilli and holy basil! Love your blog, particularly the mackerel n chips piece I am about to link in my ‘Stuffed mackerel’ post. Hope that is ok? …yes, of course – link away! Give it another go – it’s worth persevering with.